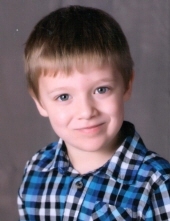 JANESVILLE--- Joseph Lee Goyette, age 5, of Janesville, died unexpectedly Tuesday, March 19, 2019, at Mercy Hospital. He was born at Mercy Hospital in Janesville on January 20, 2014, the son of Ruby Pomplun and Trevor Cooper. Joseph was a very active and energetic young boy who loved superheroes! His favorite color was yellow, favorite food was Sloppy Joes and always said he wanted to be a police officer when he grew up. He loved animals especially his pets, Char Char and Emma, and he also enjoyed spending time with his cousins Lilly and Autumn. He was a student in the P4J program at Jefferson Elementary but had attended Children’s First earlier in the school year. He is survived by his mom and dad, Ruby Pomplun and Trevor Cooper; a sister, Kree Nichole; grandparents: Jackie and Tim Eisner, Brook and Steve Schumacher, Emil Pomplun and Tait Jenson; great grandparents: Doris Miles, Deanna and Dale Jenson, Nancy and Jim Allen, and Joseph Goyette; special cousins, Lillianna Eisner and Autumn Meyer; as well as numerous aunts, uncles, cousins, and other relatives and friends. He was preceded in death by his biological father, Justin Goyette, grandparents, Sharlene Goyette and Ed Miles; and an aunt, Angel Pomplun. Funeral services will be held at 2:00 p.m. on Sunday, March 24, 2019, at the APFEL EHLERT FUNERAL HOME, 315 Lord St. (Hwy 51) Edgerton. Pastor Joe Reeves of Crosspointe Community Church, Whitewater will preside. Burial will be in Milton Lawns Memorial Park. Visitation will take place on Sunday from 12:00 p.m. until the hour of service at the APFEL EHLERT FUNERAL HOME. The family is asking those choosing to attend that the men wear a superheroes shirt and the women wear yellow, his favorite color. Memorials to the family are appreciated. To send flowers or a remembrance gift to the family of Joseph Lee Goyette, please visit our Tribute Store. "Email Address" would like to share the life celebration of Joseph Lee Goyette. Click on the "link" to go to share a favorite memory or leave a condolence message for the family.